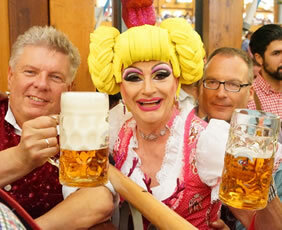 Rosa Wies'n - A Very Gay Oktoberfest in Munich! While 6 million people from around the world getting together to drink beer and sing Bavarian songs might not sound like a gay haven, for one special Sunday during the legendary Oktoberfest, it kinda is. 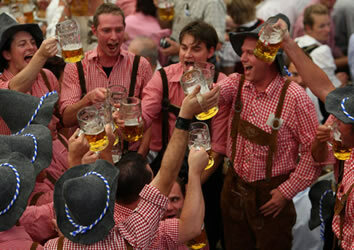 Gay Oktoberfest is known in Germany as Rosa Wiesn-Oktoberfest, which directly translates to "Pink Meadow Oktoberfest". While nothing bars homosexuals from attending any day or area of the festival, several events during the festival draw a largely gay, male crowd. • Welcome drink at your hotel and accommodation. • Start your morning short city tour at Marienplatz Square, cultural center of the city, where you will join the crowds watching the famous glockenspiel clock dating back to 1908 with its colorful mechanical figures dancing the top of the hour. • Continue to the imposing Frauenkirche and Englischer Garten. • Observe the countless museums, galleries, palaces and historic monuments including the Koenigsplatz and the monument lined Ludwig Strasse. • Lunch on your own to taste local specialities. • In the afternoon free time for shopping and having fun at Oktoberfest in Theresienwiese. • Afterwards typical Bavarian dinner at a local brewery to taste delicious German products. Rainbow Tips: Live the vibrant LGBT atmosphere in one of the many pubs like Soul-City or New York. • Live the magic and gayest atmosphere with “Gay Sunday", the very soul of gay Oktoberfest in the Bräurosl stand (opened from 09.00 am till 22.00 pm)! 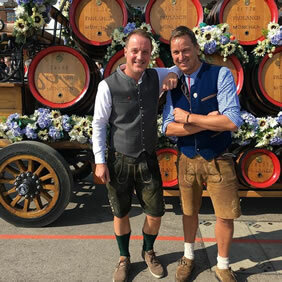 • “Gay Sunday” at the Bräurosl stand is traditionally the largest gay event in Munich after the Pride, where you will have the opportunity to meet more than 8.000 gays and lesbians. But this is by no means the only gay party that takes place here. 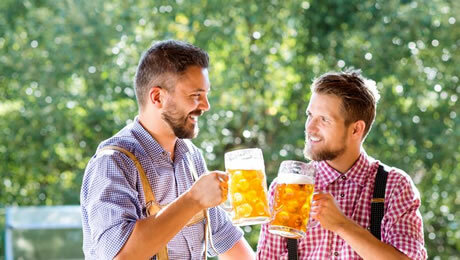 The Bräurosl beer tent is just one of 14 such tents located on the green open spaces of the Theresienwiese fairground. • There is the traditional drinking, eating and conversing with an international crowd, as well as special events like a drag show. • Lunch and dinner on your own to taste local specialities and drink authentic German beer. Rainbow Tips: Live the vibrant LGBT atmosphere in one of the 9 Official Discos like Carmens, Gay-T-Dance, Doublecross, Ny Club, PopParty, U27 or Pubs like Camp, Eagle Munich and Ochsengarten.